Located entirely within the city limits of Los Angeles is Topanga State Park. It's considered the world's largest wildland within the boundaries of a major city. 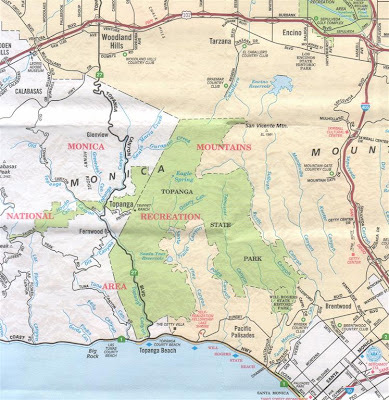 Topanga State Park is huge: 11,000 acres, or over 17 square miles. To give an idea of how big that is, it's twice the size of the entire city of Santa Monica. The "Metropolitan Los Angeles Guide Map" comes from AAA and shows both Topanga State Park (green) and the city of Los Angeles (tan). Of course, the actual map is huge and the city of Los Angeles is much larger than I was able to get in here. I apologize for the crease down the middle of the map; that comes from scanning a map taken from my car. You can click on this for an enlarged view. Trippet Ranch is the most user friendly and scenic area of Topanga State Park. It's located at the end of Entrada Road in Topanga Canyon. A few days ago my wife and I spent an hour or so here. Parking is $8, although during the week it's possible to park about 1/4 mile from the entrance and walk in. Spring is a great time to visit: there are beautiful stands of oaks set among green meadows. Trippet Ranch is also home to a small herd of deer. If you want to see them, I've found the best time is late in the afternoon. They are usually grazing together in the open meadows or oak groves. As a Christian living in America, I've found it's easy to have a thankful heart when I've got a job, a place to live, food, clothing, and the "stuff" of life. But, as Habakkuk asks, and what Christians in other parts of the world experience, what about when those things are taken away? Do I have an eternal perspective, really trusting in God as Savior, or do I just view Him as some sort of cosmic genie? I'd like to think the former, but I also know myself fairly well. Some beautiful wildflowers. Another part of the Creator's handiwork . . .
All within the city of Los Angeles. Topanga State Park: definitely worth a visit. Zag--re that "wildflower." It looks possibly like periwinkle, or vinca, a non-native groundcover that is considered to be invasive. I have it growing in several of my plant beds because it does well in the shade and has early spring flowers. Of course, it has "escaped" from gardens and now grows in the wild, much like English ivy, another invasive. God's creation is an invasive. Pretty amazing that this is within in L.A. city limits. I'm suprised more people don't know about Topanga State Park.